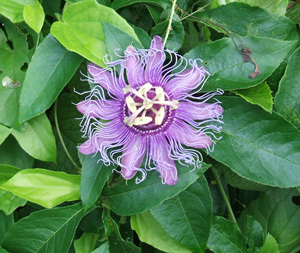 Passion Vine (Passiflora) produce very exotic flowers that have come to be symbolic of the crucifixion. I planted a red one several years ago here in central Florida under an open fence that I created just for various blooming vines. It was quite spectacular to see the bright red blooms appear each year, but I eventually had to remove it because it became too aggressive, trying to take over the entire fence and the nearby grapefruit tree. I'd heard they can cover a tree, and it's true. I still have some in a pot in hopes I can find a better home for it, but I decided to let the other more well behaved vines have their day in the sun too. 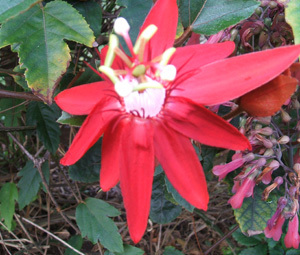 This vine is native to tropical Central and South America, places such as Mexico and Brazil. It's a terrific climber and does best in full sun to part shade. Propagation is by cuttings or layering. It comes in many colors including bright reds and purples. There are numerous varieties, some of which offer fragrance or edible fruit, but always beauty.